Wilhelm “William” Hespeler was born on December 29th, 1830 in Baden-Baden, the smallest district capital in Baden-Württemberg. His Lutheran parents placed a lot of importance on education, so Hespeler went to a polytechnic school in Karlsruhe in conjunction with his high school education. A few years after his father’s early death, his mother took the family and emigrated to Ontario, where Hespeler got into the professional world by working for his brother’s company. 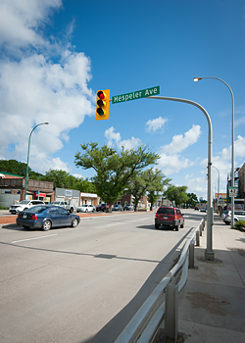 The Hespeler Avenue in Winnipeg | © Goethe-Institut Montreal During a vacation in Germany in 1872, Hespeler, a Lutheran, learned that many Mennonites were intending to emigrate to North America. Upon his return, he let the Canadian authorities know about this, and further informed them that these Mennonites had a great amount of productive, agrarian knowledge. As a result, he was named an official “Special Immigration Agent” without further ado. In this position, he was to strengthen Canada’s connections with Mennonites from Russia and coordinate their move to Manitoba. Starting in 1873, he held the office of the Commissioner of Immigration and Agriculture in Winnipeg for 10 years. He next took over the post of Honorary German Consul for Manitoba and the Northwest Territories. He was known as a faithful representative of the German Empire who regularly concerned himself with the interests of everyone of German descent. He not only supported the German community with matters regarding immigration, but he also founded the weekly publication “Northwestern / Der Nordwesten” in order to spread information within the community. Hespeler reached the highpoint of his political career when he was elected to the Legislative Assembly of Manitoba (the provincial parliament) as an independent candidate in 1899. He also became the Speaker of the Legislature, and was the first Speaker Canada-wide not born in the British Empire. However, the First World War and Germany’s poor reputation at the time had a negative influence on his standing in Winnipeg society. After the death of his third wife, William Hespeler moved to be with his son living in Vancouver, dying shortly thereafter. Hespeler supported the waves of immigration at the end of the 19th century and helped many families (a total of over 7000 migrants) to live in peace in western Canada. As a result, he played a key role in the establishment of Western Canada. To this day, it is understood that he contributed significantly to the cultural and linguistic preservation of the German community. Commemorative plaque in Neverville | © Goethe-Institut Montreal William Hespeler is commemorated not only by Hespeler Avenue, named after him, but there is also a memorial plaque from 2007 dedicated to him. 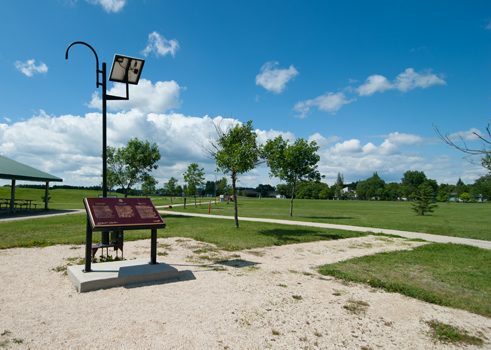 This plaque is found in the town of Neverville, located south of Winnipeg.